The LG Optimus L3, which launched about a year ago, was an ultra low-end Android smartphone that had little to impress with. Well, we’re now holding its successor in our hands - the LG Optimus L3 II, and it looks like not much has changed. 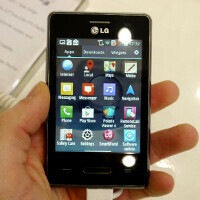 For starters, the Optimus L3 II is of relatively small size, which makes it suitable for teenagers’ hands. Something tells us that ladies might also like its petite footprint. What few will be satisfied with, on the other hand, is the smartphone’s low-res IPS LCD display. Spreading 240 by 320 pixels across 3.2 inches of real estate gives us a disappointing figure of only 125ppi – low enough to bring tears to your eyes. Oh well, at least the screen exhibits some pretty decent viewing angles and good colors. Considering that the LG Optimus L3 II is just an entry-level smartphone, we’re okay with it having just a 1GHz single-core processor. In fact, its performance is adequate as our quick test shows, although one shouldn’t expect any wonders out of it. What we’d also recommend not having high hopes for is the 5-megapixel camera on its back. Despite its 5 megapixels of resolution, it lacks auto-focus, so the photos that it takes are likely to be mediocre. There are only 4 gigs of storage available on the LG Optimus L3 II, so providing it with a microSD card is more or less mandatory. We’re glad to see that the LG Optimus L3 II comes with a relatively recent version of Android - Android 4.1 Jelly Bean. Considering the entry-level nature of the device, however, we aren’t expecting it to ever get an update to anything newer. Seeing a 1,540mAh battery behind its back cover is a nice surprise as it should be enough to deliver satisfactory battery life. Take a gander at our hands-on pictures of the handset in the slideshow below.